Perth-based energy giant SSE said on Tuesday it is exercising its pre-emption right in the sale of Fluor Ltd.’s 50% share in Seagreen Wind Energy Limited, established to develop offshore wind projects in the Firth of Forth Zone. SSE already holds the other 50% share of the joint venture and will purchase Fluor’s share for a single payment of £118 million. “The transaction is subject to approval from Crown Estate Scotland, the public body that manages leasing of Scotland’s seabed,” said SSE. “The future ownership structure will be further reviewed in the coming months with the view to maximising value for SSE shareholders. Seagreen Phase 1, consisting of the “Alpha” and “Bravo” projects, is targeting up to 1.5GW of capacity. “The project team is seeking amendments to the existing consent (1.05GW) to take advantage of the advances in offshore wind turbine technology since the original consent was granted in 2014,” added SSE. 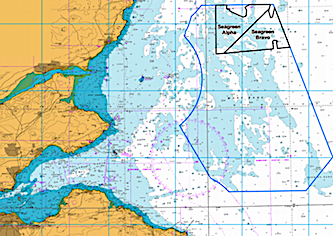 “SSE also intends to develop further phases in the Seagreen area. “SSE remains focused on preparing the Seagreen Phase 1 projects in readiness to bid in the upcoming UK contracts for difference (CfD) auction, expected in May 2019. “SSE’s share of existing offshore wind assets is significant in terms of volume and profit contribution, with both Walney and Greater Gabbard successfully operating since 2012. SSE wholesale director Martin Pibworth said: “The Seagreen acquisition aligns with SSE’s ambition to create value from owning, operating and developing clean energy assets and infrastructure. “We are looking forward to taking full ownership of Seagreen as we progress through this critical phase towards the CfD auction, expected in May 2019.